Photo: Victor Prado/New York Magazine; Illustrations by John Burgoyne. You’ll find Hass avocados in the supermarket year-round, but their oil content increases in the spring, rendering them especially rich and buttery. And although they’re loaded with fat, it’s the good, monounsaturated kind. Calliope co-chefs Ginevra Iverson and Eric Korsh like to mingle the diced fruit with mackerel, another nutritional overachiever, for a dish that not only may lower triglyceride levels and fight free radicals but also tastes pretty sensational. For the mackerel: The day before serving, cut the fillet into small pieces, leaving the skin on. Season with salt and pepper. Heat 3 tablespoons of olive oil in a cast-iron pan over medium-high heat until oil is shimmering. Add the fish skin-side down to the pan. Reduce heat to medium-low, and cook until nearly opaque. While the fish cooks, in a heavy-bottomed saucepan, whisk together 1 cup olive oil, the canola oil, and the harissa. Over medium-low heat, warm the harissa-oil mixture until hot and fragrant. Place the cooked fish in an earthenware container, skin-side up in a single layer. Pour the hot harissa oil over the fish. Let cool to room temperature, then refrigerate overnight. For the salad: Remove the mackerel from the refrigerator, and bring to room temperature. In a small bowl, whisk 2 tablespoons olive oil with the lemon juice and reserve. 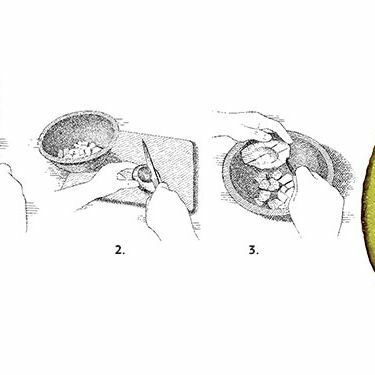 (1) Cut the avocados in half by slicing lengthwise into the fruit and rotating it around the knife. Twist to separate the halves. (2) Remove the pit by chopping into it with a knife and twisting it free. (3) Dice each half-avocado inside the skin, and spoon out into a serving bowl. Add the sliced scallions and the sesame seeds. Toss with the lemon-olive-oil dressing. Place the mackerel on top of the salad, and generously spoon some of the harissa oil over the fish. (Save remaining oil for another use.) Finish with Maldon sea salt. Serves 4. Sorry! This video no longer exists. *This article originally appeared in the April 1, 2013 issue of New York Magazine.